I'm guessing you've all planned a party before. How did it go? Share any tips or anecdotes you have with [email protected] and your entry could be featured in the July newsletter! 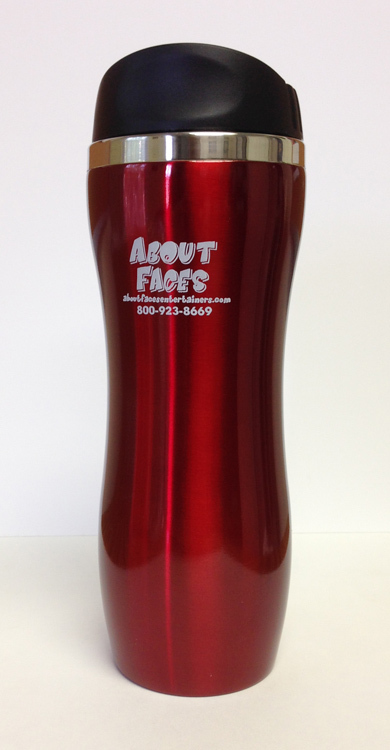 The person who shares the best tip will receive (drumroll please...) an About Faces Travel Mug!!! Thanks for taking the time to check out our newsletter! It's almost June, and that means it's the perfect weather for outdoor parties like barbecues and picnics. Guess where you can find great entertainers for those parties? Well, there's this company called About Faces Entertainment. You've probably heard of it before. We've got caricature artists, face painters, balloon sculptors, and many more types of entertainers who can please guests of all ages at any kind of event. Check out our website, shoot us an email, or call 1-800-923-8669 to book an entertainer today! June's Featured Entertainer is Kent R! Kent is a Pennsylvania caricature artist. I went behind the scenes and conducted an exclusive interview with him! Check out his page on our website for more information about Kent. AFE: How would you describe your job? Kent: I define myself as an artist. I tell people I educated myself by "studying" MAD Magazine. As a child, it shaped (warped) my world view and got me excited about cartooning and caricature. I love drawing caricatures, and I pride myself in getting strong likenesses. I enjoy interacting with guests, learning about them while I draw. Besides caricature, I also paint pet portraits and teach art classes. How and when did you get into this business? It developed gradually over the past 20 years or so. I got steady work with a party planner, and eventually started setting up at art and craft shows as well. For practice, I used to draw "Who Wants To Be A Millionaire" contestants off the TV screen. I kept count...drew 530 of them. The more money they won, the more detailed the caricatures. And yes, I drew Regis. What is the most memorable event you've ever worked? I once was hired to draw at an annual gathering of Funeral Directors. They were the funniest people I'd ever met...I was laughing at their stories the whole time. Go figure! While I do many types of art, I really "come alive" when I do caricatures. It's an interactive art form that keeps everyone entertained. Live caricature drawing "recharges" my artist batteries! We love hearing from you! You can reply to this newsletter or comment on our Facebook, Twitter, or Google+ pages. We loved the entertainment experience we received from About Faces Entertainment!! My son's birthday was a hit with the combination of the balloon twister and the face painter. The boys had so much fun getting their faces painted like superheroes, followed by running around the park with their balloon "swords and machine guns" ... When one balloon popped another was promptly made for them. You can't put a price on the smile of a mom's face watching her child have such genuine carefree fun! Thanks again for the wonderful experience. If you, too, have had a great experience working with About Faces Entertainment, let us know! Thanks again for reading this newsletter! Don't forget to check back next month!